Fiat is riding the waves again for the third year as sponsor of Vans U.S. Open of Surfing, one of the events under the World Surf League (WSL) banner. At the Huntington Beach, Calif. event, starting Saturday and running for a week, Fiat will have its full lineup of Fiat vehicles and a branded experience. The program also features the just-launched 2016 Fiat 500X crossover, which has been the beneficiary of an ad campaign that debuted during the Super Bowl this year. Fiat will also use the event to activate on its ongoing Jones Soda sampling, part of a promotional relationship (#JonesinforaFiat500X), that began in 2013, with the “Jonesin’ for a Fiat 500X” photo contest. This year's program, running through October, dangles a 2016 Fiat 500X crossover, and a year’s supply of Jones Stripped, and the winner's photo on a Jones Soda label. The deal also puts the soda brand in Fiat Dealerships as part of a Fiat-run sampling program. 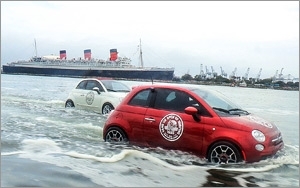 Fiat isn't alone in the water. This year FCA's Jeep brand signed on as the official, category-exclusive global partner of the WSL, which is holding six men's tours and four women's tours. The deal gives the automaker title sponsorship of the “Jeep Leaders” points leaderboard of top surfers. Jeep also gets advertising on the World Surf League web site, and gets its name on the leader's yellow jersey. Jeep also has naming rights with the WSL Longboard Championships, which is tentatively scheduled for Taiwan in November. Jeep is also displaying its vehicles at WSL events. The men's and women's champs get Jeep vehicles. At Huntington Beach, Fiat will also be doing giveaways of branded merchandise, and Fiat is covering the competition on its social channels. Facebook, Twitter and Instagram. The U.S. Open of Surfing follows on the heels of the J-Bay Open in South Africa. Mick Fanning and Julian Wilson split the prize, which is very good news, as Fanning was attacked by a shark on the final day, which pretty much ended the event. He came out of the scuffle unharmed.